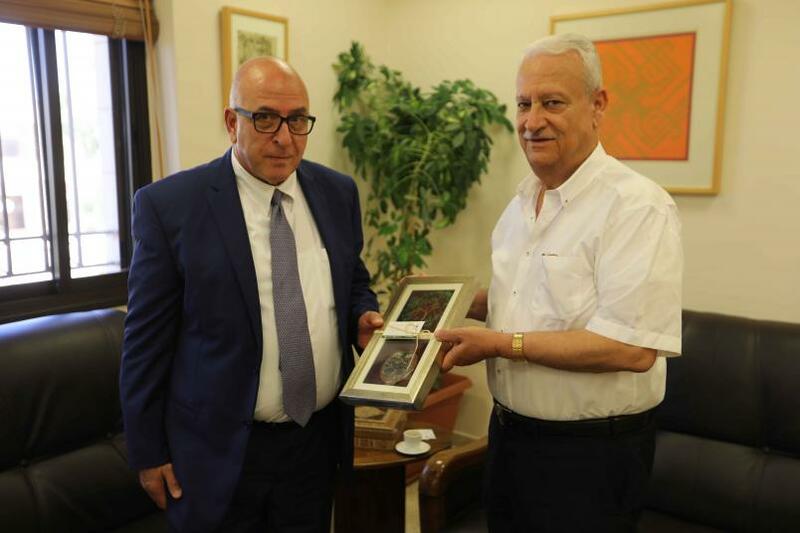 Founder, President, and CEO of the Holy Land Christian Ecumenical Foundation and Know Thy Heritage Foundation (KTH) Rateb Rabie visited Birzeit University and met with Birzeit University President Abdullatif Abuhijleh to look into prospects for cooperation. Rabie was accompanied by the Program Coordinator of KTH Delegation Nicolas Kawas, who attended the meeting with Abuhijleh and the Officer of External Academic Relations Amir Khalil. Both parties discussed organizing the Seventh Annual Palestinian Diaspora Conference, to be held at Birzeit University’s Palestine and Arabic Studies Program next Saturday, July 14, 2018. Abuhijleh and Rabie hope that the conference will achieve its objectives, which focus on cementing the networks of diaspora Palestinians, reviving the momentum among diaspora networks in preparation for the growth and strengthening of diaspora initiatives, and giving the participants a valuable experience in examining important issues to Palestinians, including those in diaspora. Abuhijleh and Rabie discussed how the HCEF and KTH can integrate their efforts to organize an array of events and fundraising activities in the United States. Such events engage Birzeit University more among the academic community in the States, and help the university continue its academic mission by providing scholarships to students, as well as state-of- the art buildings and infrastructure.